And why, on Saturday morning, did nearly 40,000 athletes in Richmond do the same thing? I could have, just as easily, woken up and taken a long walk in a quiet neighborhood at my convenience. There would have been no entry fee, and no one stepping on my heels. 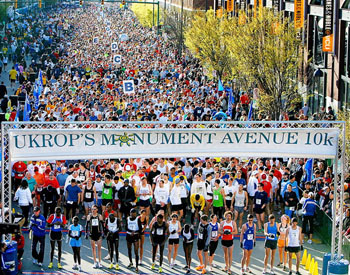 The answer for the Monument Ave. 10k was the same as it is every race. It’s about community, joining other runners at the starting line and struggling alongside them to the finish. It’s about being a part of something that is larger than yourself. The runners that ran the Boston Marathon could have woken up and run 26.2 miles on their own. It’s just 26.2 miles, it doesn’t matter where or when you do it; there isn’t anything unique about the race route in Boston. One thing that makes Boston special, even more special than other marathons, is its prestige. If you’re not a runner, you might not know that it’s really, really hard to run the Boston Marathon. 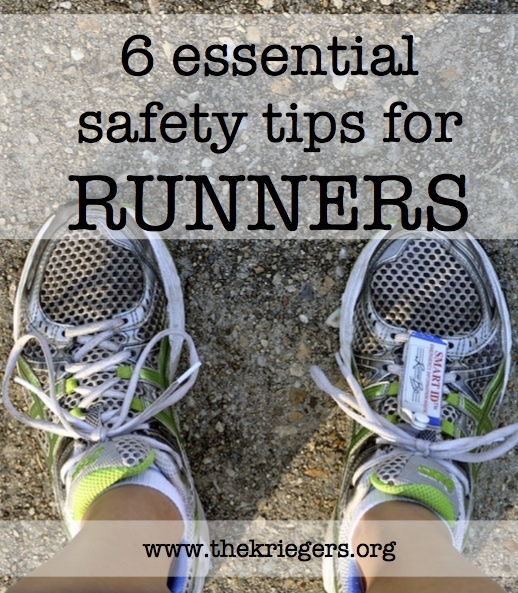 It’s not like most races; you can’t just enter, pay your fee and show up on race day. You have to run a qualifying time, and the qualifying times are tight. Lots of runners spend years training and trying to run qualifying times. Plenty of talented, dedicated runners will never qualify for Boston. 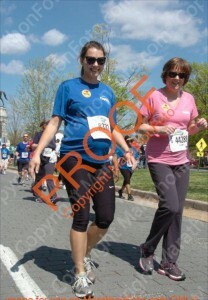 Unless something changes, I can’t foresee that I’ll ever run Boston. 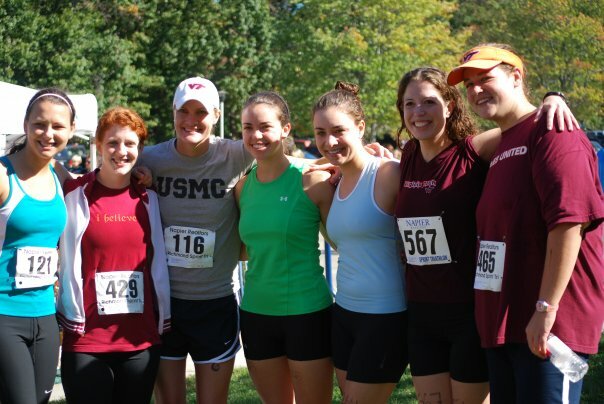 I’ve said this before: for me, running is mostly about community. 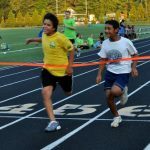 It’s more about community than it is about training, negative splits, or PRs. 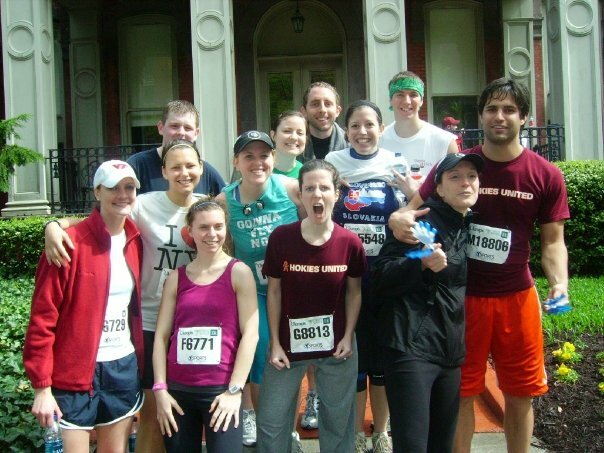 Most of my best friends are runners, and that’s been true since I started running in high school. When things happen like what happened at the Boston Marathon, we start looking for ways to connect. This blogger talks about it, a desire for connection, even when there isn’t one. 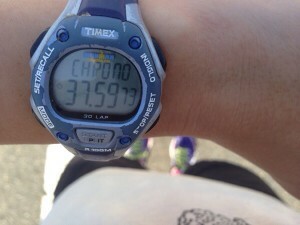 I made connections quickly: I am a runner, I have friends who ran the Boston Marathon yesterday and friends who live in Boston. 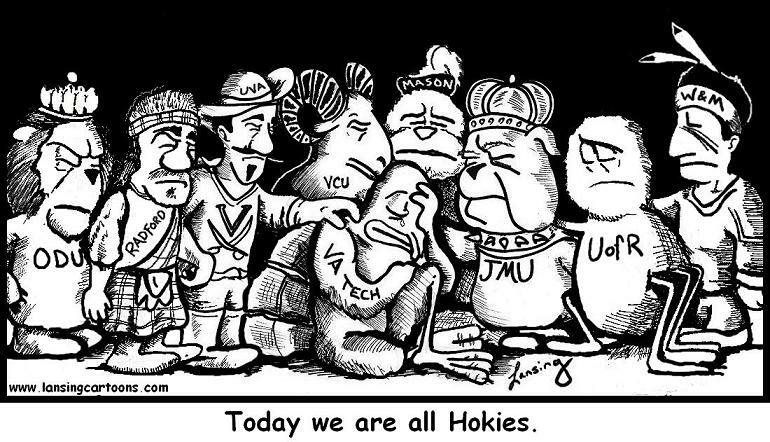 After the shootings at Virginia Tech, which happened six years ago today, something I remember being touched by most was a cartoon by Ben Lansing. Of all the images from that terrible day, this one said what we all felt, what we all wanted to be assured of: we’re all in this together. The tragedy at Virginia Tech wasn’t isolated event felt only by those directly affected, or even just the Virginia Tech community. It was a human tragedy. This desire for connection is a human response in the face of an inhumane act. Now that the shock is settling, we’re looking for comfort. There are beautiful stories coming out of this tragedy. There are silver linings, images of loved ones being reunited, and stories of kindness (thanks, Laura). If you’re like me, you look for comfort in answers: Who? Why? How? Are races still safe? How will this change things? What’s going to happen next year? Yet comfort, true comfort, comes in trusting that Jesus is at work even in the terror and confusion. That doesn’t make the heartache go away, but it does give us a safe place to hope. We should grieve together, because that ache we feel for community is how God created us. He created us for for relationships and to express his love to one another. And together in our grief we can look forward to the day when he will wipe away all our tears. Until then, we can find great comfort in the truth that the God of the universe loves us and sees each tear we shed. Wonderful post, Amanda. Thanks for putting words to a lot of what I was already thinking and feeling. Great great post. Well said. Thank you!